Someday I will create an app that is just for gardeners. My app will use your phone’s GPS to tell you every place nearby that would be of interest to a gardener: nurseries, garden centers, botanic gardens, cemeteries, parks, outdoor history museums, farms, that day’s garden events…YELP might be for restaurants and gas stations, GELP [Gardeners Eager for Local Places] would be for “anything garden.” Trip Advisor needs a gardener’s tour section too. 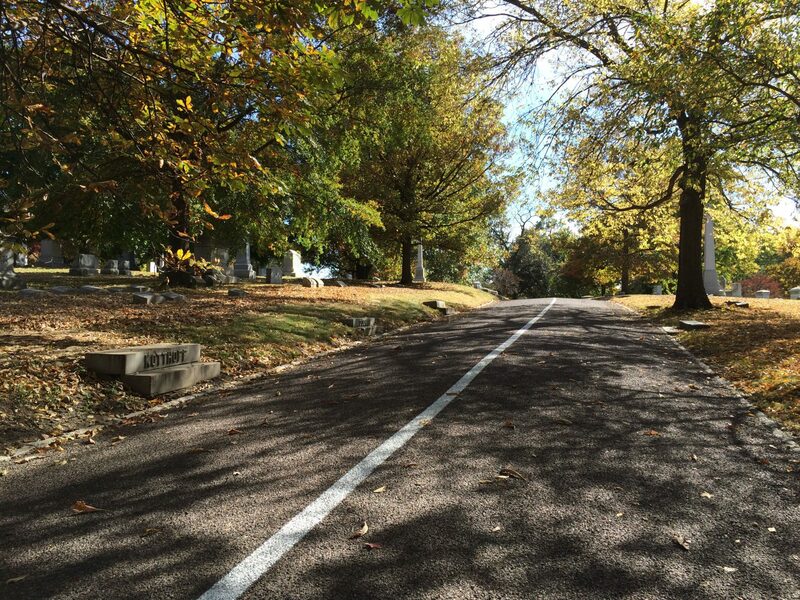 Nearby we visited Bellefontaine Cemetery, which is of interest for three reasons. First, founded in 1849, it is a great example of the bucolic cemetery (and early park) movement in America. Second, Bellefontaine was designed by Almerin Hotchkiss, who is reputed to have also designed Lake Forest, IL, where we live. I wondered if there were obvious comparisons between the two places. Answer: yes. Third, when Lake Forest decided a few years ago to update its “Forest Park” (the Chicago region’s third oldest park, set aside in 1857), I (and others, including the family of O.C. Simonds) worked hard to have its chosen landscape architect treat it as a “cultural landscape” so that it would retain its historic character. 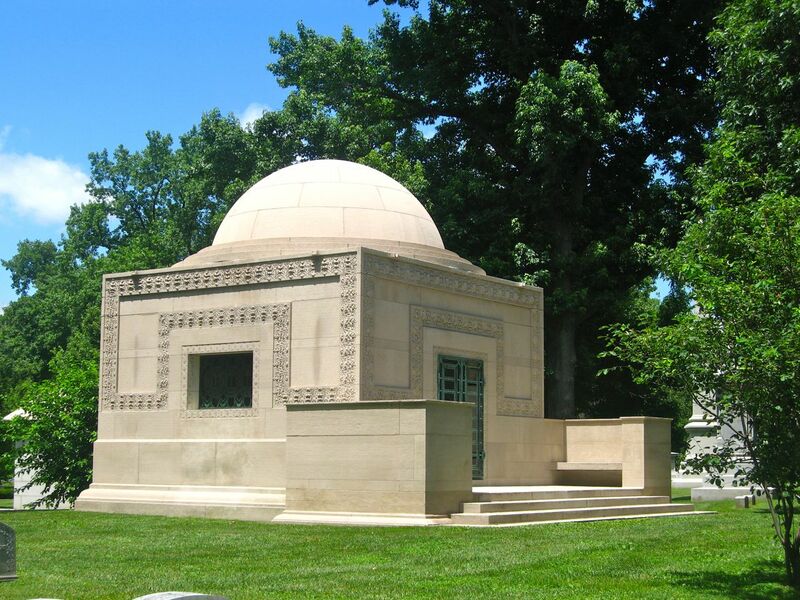 Turns out the chosen landscape architect cared more about being contempo than being historic, so while the idea of cultural landscape preservation didn’t work out in Lake Forest, it has at Bellefontaine. Beautifully. The trees are awesome! John and I were heartened to see that Bellefontaine’s streets are paved with macadam (lots of aggregate), has granite curbing flush with the grass, trees planted this-close to the streets, a high crown in the road to steer drainage, adherence to the topography, and sight lines created by the judicious placement of trees and shrubbery, including (this is a modern motif) pockets of prairie grasses. The cemetery–the fourteenth of the great rural cemeteries in America–is in itself an accredited arboretum. After seeing this jewel, we were compelled to go downtown to see the 1891 Wainwright office building (“the building that changed America”), which has not fared as well as the mausoleum. To save it, the State of Missouri bought it (in the 1970’s? ), saved the exterior (mostly), and turned the inside into the-most-banal-looking government offices. Even the Soviets would be embarrassed. Off we went for lunch in “The Hill”–the fantastico Italian neighborhood–and then to the 79-acre Missouri Botanical Garden. The MBG is informally known as “Shaw’s Garden” for its founder, Henry Shaw, who often traded trees with…wait for it…Almerin Hotchkiss. This garden was Shaw’s home (still there) and dates to 1859, which puts it on the National Register of Historic Places. The MBG is well known for its 1977 Japanese garden, called Seiwa-en, which is the largest Japanese garden in America as well as its 1960 Climatron, the first geodesic dome greenhouse. Not to mention the Bavarian Garden. 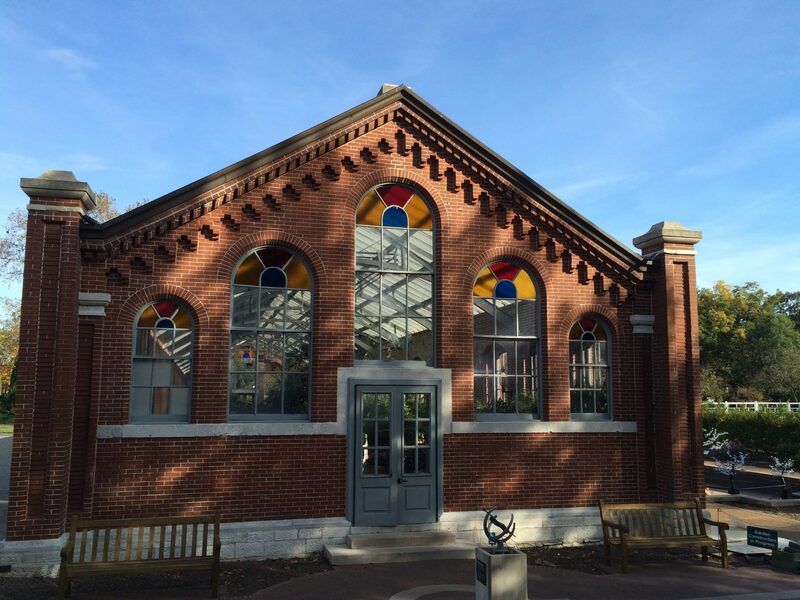 And we loved the 1882 Linnean Greenhouse, the oldest operating greenhouse west of the Mississippi. Wow! What a wonderful trip! Joe and I “hot-air ballooned” in Forest Park years ago (many) and it was beautiful! 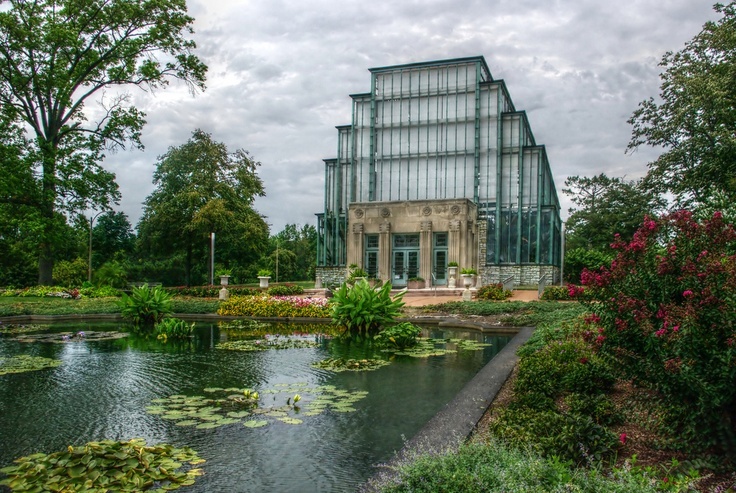 Not sure if we saw the Jewel Box Greenhouse tho. Seems we were always up in the air!!! Or Chasing over the RIVER!! So interesting, Rommy. Historic Preservation and old gardens are up my alley. Thanks for sharing. Your idea for an app is a good idea. Loved the tour. Really missing our gardens. I think GELP is a great idea! Lake Forest College had a past president, Eugene Hotchkiss. Any relation to Almerin ? O.C. Simonds lives on! And not just in the memories of those of us who fought to retain his plans for Forest Park. Evidently there are others who appreciate his work. Sounds like a great weekend, and a wonderful trip. We’ve been to some of those sites…but not all. Guess we need to get the buggy out of the barn. Wonderful description of your trip to St. Louis. Lots of history along the banks of the waterways that pass through St. Louis…all the way back to first French towns along the Mississippi River all the way down to New Orleans and up to Northern Illinois and Canada. 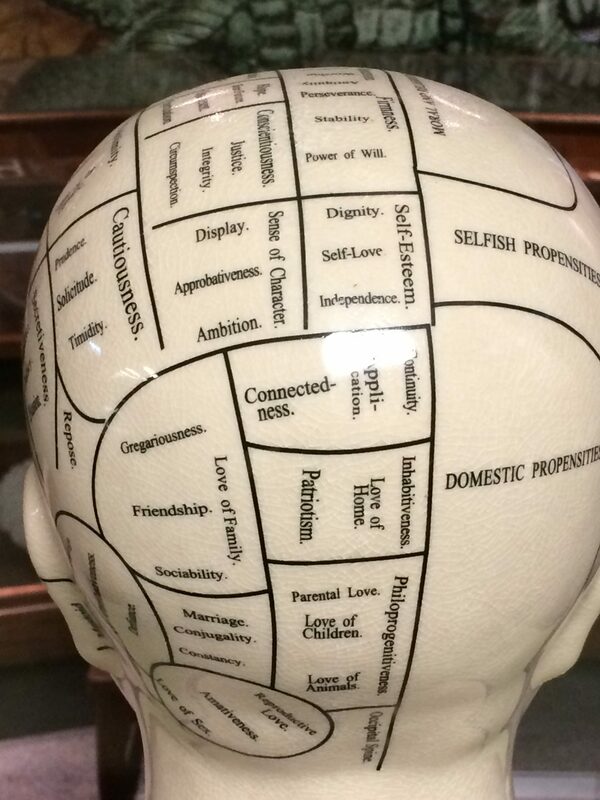 Those phrenology heads were interesting, weren’t they? Thanks for sharing your summary of places to go. Would be fun to go there for a long weekend.